The case at hand is unique. In part, this is because the programme challenged here is itself without precedent. No democratic society has adopted a programme that is similar in its command and sweep. There are few judicial precedents to guide us. The closest foreign cases have all been decided in favour of the citizen, repelling the invasive programme by the State. This case is about a new technology that the government seeks to deploy and a new architecture of governance that builds on this technology. The government and its supporters contend that the biometric technology employed and the Aadhaar Act is greatly beneficial. The petitioners challenge the programme and the statute and rely on material that discredits the government’s tall claims. The petitioners are certain that if the Aadhaar Act and programme is allowed to operate unimpeded it will hollow out the Constitution, particularly the great rights and liberties it assures to citizens. A People’s Constitution will transform into a State Constitution. The question that arises is whether the Constitution of India allows the State to embrace this new programme or whether the Constitution repudiates this giant electronic mesh. The petitioners submit that the Constitution firmly repudiates Aadhaar. The Constitution must do so in order (a) to preserve itself, its abiding values, its foundational morality and (b) to protect citizens from the advent of an all-seeing, intrusive State that recognises not the individual, but a number. Writing in 1974, Nani Palkhivala analysed the Kesavananda Bharati case in a slim volume he titled, The Constitution: Defaced and Defiled. The threat here is far more insidious. We do not have a frontal attack on the Constitution by amending it. Instead, through a succession of marketing stratagems and by employing smoke and mirrors, the government has rolled out a little understood programme that seeks to tether every resident of India to an electronic leash. This leash is connected to a central data base that is designed to track transactions across the life of the citizen. This record will enable the State to profile citizens, track their movements, assess their habits and silently influence their behaviour. Over time, the profiling enables the State to stifle dissent and influence political decision making. As the Aadhaar platform extends to private corporations, the degree of tracking and extent of profiling will exponentially increase. Several State governments have started using the Aadhaar platform to build profiles of residents that is reminiscent of totalitarian regimes. 6. At its core, Aadhaar alters the relationship between the citizen and the State. It diminishes the status of the citizen. Rights freely exercised, liberties freely enjoyed, entitlements granted by the Constitution and laws are all made conditional. Conditional on a compulsory barter. The barter compels the citizen to give up her biometrics ‘voluntarily’, allow her biometrics and demographic information to be stored by the State and private operators and then used for a process termed ‘authentication’. The State issues an Aadhaar number and then requires the number to be embedded across service providers and agencies — unless the number is seeded in databases of the service provider, the citizen is denied access to these most essential facilities. Inalienable and natural rights are dependent on a compulsory exaction. 7. The State is empowered with a ‘switch’ by which it can cause the civil death of an individual. Where every basic facility is linked to Aadhaar and one cannot live in society without an Aadhaar number, the switching off of Aadhaar completely destroys the individual. 8. Could it ever be envisaged that under this Constitution which ‘We the People’ have fashioned after a long freedom struggle steeped in sacrifice, the State can arrogate to itself so much power that it can ‘extinguish’ a citizen or be willfully blind with respect to a citizen who would like to identify himself in a manner other than Aadhaar? 9. The Constitution balances rights of individuals against State interest. Aadhaar completely upsets this balance and skews the relationship between the citizen and the State, enabling the State to totally dominate the individual. The Constitution of India is not a charter of servitude. Aadhaar, if allowed to roll out unimpeded _reduces citizens to servitude. 10. What then are some of the key issues that arise in this case? (i) backed by law,(ii)carried out by government alone having regard to the very sensitive and personal nature of the information,(iii) preceded by a meaningful process of securing informed consent. 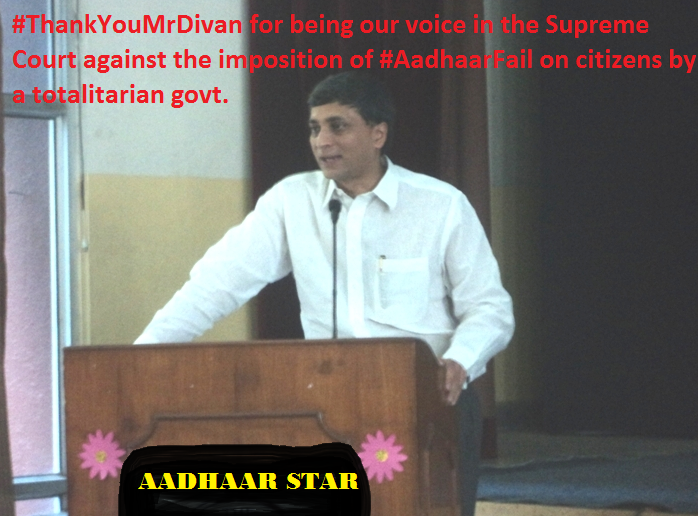 Whether the Aadhaar project conflicts with the Rule of Law and constitutionalism? d) Is the Aadhaar Act, 2016 a validly enacted law, having been passed as a Money Bill? protect her personal identity, her movements, her social interactions, etc., without being forced to part with personal information to the State and without being forced to embed her information with government departments and private entities? subsidies, etc. so long as the individual chooses to identify herself in some reasonable manner? g) Whether the coercive power of the State under the Aadhaar project can extend to children? she chooses to put out? i) Whether the vulnerability of the Aadhaar database compromises national security? to operate though not within the cover of the Act. illustratively the Aadhaar (Authentication) Regulations, 2016. • Actions by CBSE, NEET, JEE. • UGC requirements for scholarship. requiring Aadhaar linkage for filing returns. alternative means of identification. Negatively, nothing can be withheld from a citizen merely because she/he does not have an Aadhaar card or does not wish to use their Aadhaar card. (d) Mandatory directions consistent with the fundamental right to privacy and the right of a citizen to “to be let alone” that no electronic trail or record of his/her authentication be maintained.